Thanksgiving is such a special holiday bringing families and friends together. 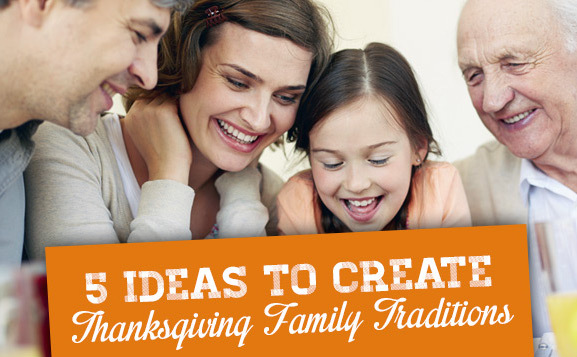 Many families celebrate traditions that have been passed down through generations. This year, we look forward to trying new traditions with our family to share what we are thankful for and spread the Holiday cheer! Create this Thankful Tree in a highly visible area in your house with brown paper or poster board. Each day, each member of your family can take a leaf and write things they are thankful for on it. Attach the leaves on the tree (with some blowing in the wind or falling to the ground) and enjoy how full it will start to look after a few days. Keep the leaves each year as a fun way to remember past Thanksgivings and reflect on how your children have grown. It will quickly become a great visual reminder of all the things to be thankful for! The Thankful Tree comes from Northeast Ohio Family Fun. The Thankful Pumpkin is such a fun way to celebrate Thanksgiving Dinner and share with one another our gratitude! Purchase a fake pumpkin and spray paint it white. At Thanksgiving Dinner or beforehand, give each person their own mini pumpkin or have a couple larger pumpkins for everyone to share. Each person then writes what they are thankful for with a Sharpie on the pumpkins, and then shares what they wrote. These make a beautiful centerpiece for your table! I love the idea of the Blessings Jar, because it invites us to write down what we are thankful for all year! Set out a jar throughout the year where everyone can add their blessings. Read through them one by one on Thanksgiving Day! Neighborhood Thanksgiving Turkey is a fun take on the popular Halloween tradition of You’ve Been Booed. Share a printable Thanksgiving Turkey with your neighbors along with a little gift, to say how thankful you are that they are your neighbor! Fun gift ideas can include packet of hot chocolate, little chocolates, bag of candy corn and peanuts, or homemade bread! Random Acts of Kindness are a great way to teach your children to help others and brighten others day! Kids have so much fun coming up with ideas of what they can do, with simple to elaborate ideas that help spread the Holiday spirit! This giving spirit can continue past the holidays and become a habit all year!